begin. Resistance Now is the latest shot to be fired from the forth coming album How To Do Battle. 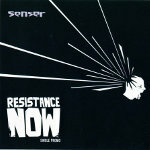 The CD version of the single comes with three tracks, two versions of Resistance Now and 2 3 Clear of which there seems to be several versions knocking about. Resistance Now is an explosive track that is an adrenalin surging blend of metal riffs and rhythmic vocals that are impossible to ignore, 2 3 Clear is an antagonistic retort to the system and vocalise’s the anger at the methods used and is another adrenalin pumping tune that goes down well, both dual vocalists sound even better then ever, belief in the lyrics is a vital ingredient in any band with anarchistic viewpoints and Heitham & Kerstin's belief's are total. A fabulous unstoppable return to the scene for Senser. I have never seen senser live but i do have the Schematic album which is brilliant and can't wait for the new album, senser do a class rap metal that blows away anything else i have heard, and this new single is just mind blowing.. way up lads!! never been much on rap metal, but this band has an edge i have never heard before and the female vocals has such a sweet powerful contrast it really raises the overall sound. love the single, like the tracks on the bands myspace and could well buy the album, going to download the free song as first step.. suprised they are British!! Brilliant band glad to see them back, Senser on this form can not only reclaim their place in the world after the layoff, but build up an even bigger fan base, great aggressive anachnistic metal..
Senser really are a top band, love the sound so much better then the US rap metal bands, senser don't worry about the christian segment, and are more interested in the music and the message then making wonger!